$250 U.S. Available in gray or green. More photos are on the company’s site for this product. The $250 MindShift BackLight 26L (the 26L stands for 26 liters of internal volume) is a medium-sized backpack designed for the outdoors photographer but can be very much at home with anyone who wants to carry a lot of photo gear on their back in a handsomely designed bag. It comes in both green and graphite colors; I chose to review the graphite colored one. The first thing I noticed is how light the MindShift BackLight 26L feels (just around 4lbs/1.8kg). I don’t like heavy camera bags for comfort reasons, and this case does not add much more weight to my already heavy camera kit. Unlike a typical backpack, you gain access to the main camera gear storage compartment from the rear of the bag rather than the front. I felt that my gear was very secure, meaning no one could just open the main compartment and steal my cameras. This is a fear I have in urban environments, such as New York City, since I really cannot sense whether or not someone is tampering with my bag when I’m walking in a crowd. The interior is roomy with enough velcro partitions to configure to your liking. I was able to fit my Nikon D7000 with a attached 28-70mm f/2.8, an 80-200mm f/2.8, a 300mm f/4, a 12-24mm f/4, and two more small prime lenses into the main compartment and I still had room for my Fujifilm X100T and more accessories. I could’ve added a couple of speed lights and a light meter and still had some extra room. 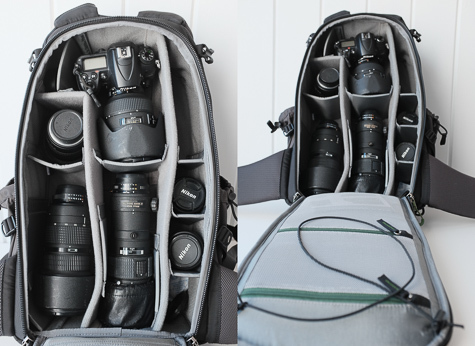 You could carry an entire photo studio in this bag should you be so inclined. The front of the MindShift BackLight 26L has a generously-sized compartment, with slots for pens, business cards, smart phones, a medium-sized laptop and a large tablet. There’s ample space for additional accessories or small gadget pouches. You could probably fit some clothing in this compartment, such as light summer clothes or the like. On the exterior of the bag is a smaller zippered compartment for additional goodies. On the top of the bag is another small, narrow zippered compartment for cables and such. The two exterior side pouches are ideal for water bottles, a small tripod/monopod or even small to mid-sized lenses. One thing you can’t accuse this case of having is a lack of places to stow things. There are multiple places where you can store a tripod on the MindShift BackLight 26L: on either side the bag or on the rear. The side pouches are probably better for smaller tripods. You can securely fasten a medium-sized tripod to the rear of the BackLight 26L. There’s a support pouch for the tripod legs on the bottom center of the backpack (which is hidden underneath a specially marked tab when not in use) and a support strap at the top of the backpack (also hidden until needed). The included rain cover has an opening at the bottom to allow the attached tripod’s legs to jut out. There are more loops and lash points on the exterior of this bag than you can shake a monopod at. You can attach as much to the outside of the bag as you can put on the inside. Outdoorsy-types will love this. Exterior zippers have giant loops which makes grabbing with gloved-fingers very easy. One really nice detail is the zippers in the interior section (where your camera gear is stowed) tuck away nicely in little zipper garages for lack of a better phrase. This is to prevent the metal zipper head from brushing up against and possibly scratching your gear. I really appreciate this feature and it tells me MindShift put a lot of effort and thought into the design of this backpack. 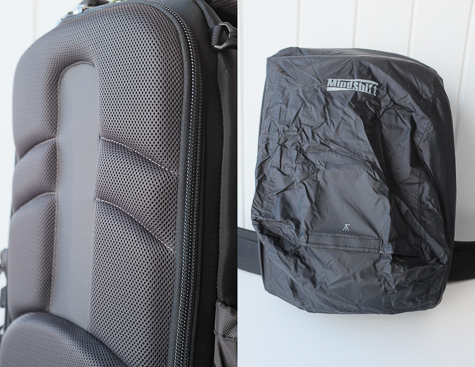 The main question is how well does the MindShift BackLight 26L hold up when filled with gear and accessories? Pretty gosh darn good, actually. I filled it with as much gear as I could and took it for a spin. The shoulder straps are thick and well padded and are great at distributing the weight evenly. They feel secure and are not likely to easily slip off my shoulders. On my urban hike, it never felt like I was carrying over 30 pounds of camera gear, and I wasn’t even using the waist strap! When I finally secured the waist strap it did an excellent job of distributing the weight to the lower part of my body and my legs. The rear of the the MindShift BackLight 26L is very rigid and well padded. 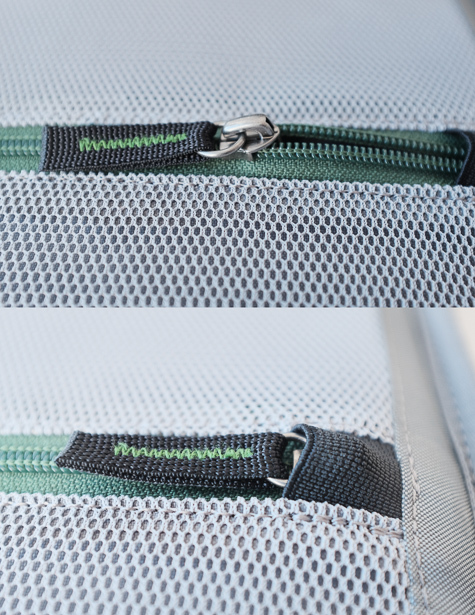 There are channels in the padding to allow air circulation between your back and the bag itself. This will be a great benefit on those hot, sticky days. My one minor quibble was the rigidity of the backpack’s back section. Because my spine is slightly curved, the case only made two points of contact with my back: just above my waist and just below my shoulders. I would prefer if the rear area was hinged so that it could bend a bit to match the curvature of my spine, but this is a minor issue. A feature unique to the MindShift BackLight 26L is while you still have the waist strap attached, you can unsling the bag from your shoulders, swing it around to your front and then have access to the interior storage compartment. When you unzip the rear flap, there’s a small cord attached which you wrap over the back of your neck that helps keep the flap open. The entire weight of the bag is supported on your waist. It looks a little silly but it helps you access your gear while not having to remove the bag and place it on the ground. In practice, I found a few issues with this method of accessing my gear. First, in order to swing the bag around, I had to loosen the waist strap a little bit otherwise it was too tight and would not spin around easily. Also, I had to remove my camera that was secured to my body on a BlackRapid cross shoulder-styled strap. This was a little awkward to accomplish. Once I got the backpack in the reverse position, it felt very secure against my waist. It didn’t feel like the strap would break or rip, even with 30lbs+ of equipment in the case. I was told by a MindShift rep at a recent photo show in NYC that the waist strap had “gusseted reinforcing” for this exact purpose (a “gusset” is extra material sewn into the seams to help to strengthen them). It wasn’t too pleasant for me to do this as I felt like I might fall over frontwards. I can see this being a great advantage if you’re standing in water or don’t want to put the bag down on a dirty surface to access your gear, but it did feel awkward to me. The MindShift BackLight 26L comes with a separately packaged rain cover that I was very happy to see. I’d still rather have it integrated within the bag like other manufacturers do, but it’s great having a rain cover that doesn’t require a separate purchase. 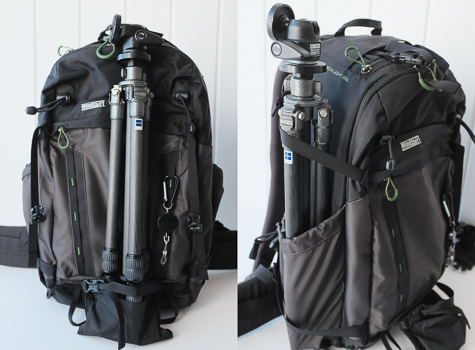 The cover encompasses the entire front and sides of the backpack, including an attached tripod, leaving the rear side (with the shoulder straps) exposed. The material the bag is constructed from is somewhat water resistant, so you’d only need this rain cover in steady rain or downpours. The rain cover also opens flat and doubles for use as a ground tarp. Very handy. There are a couple of things I’d like to see improved in the next version of the MindShift BackLight 26L, such as a thicker handle on the top of the bag for a more comfortable grip and perhaps an integrated rain cover (Lowe Pro has done the latter well with rain covers built into the bottom of almost every bag). 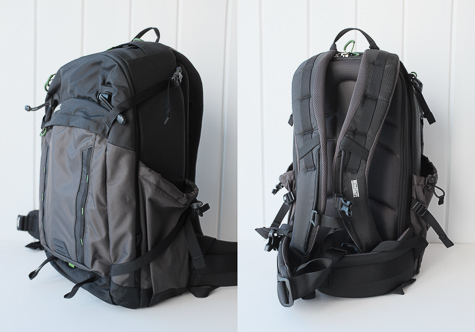 Other than those minor quibbles, MindShift has a winner premium photo backpack here. 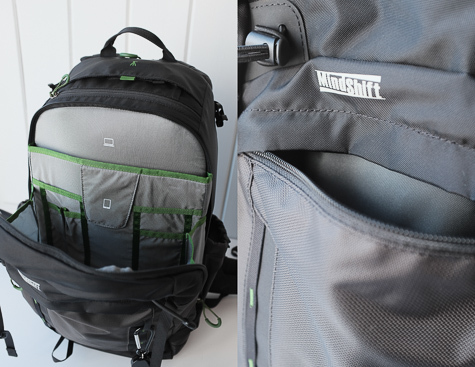 The MindShift BackLight 26L is well constructed with a fine attention to the small details (such as zipper garages). Nothing seems extraneous on this case. I’m happy to carry this backpack on outdoor treks and to corporate gigs, and I can see that I’ll be using this bag for quite a long time.